As a part of my WIC responsibilities for ISPP dietetic rotations, another intern and I went to assist at the Morgantown Farmers market to distribute WIC vouchers to participants. 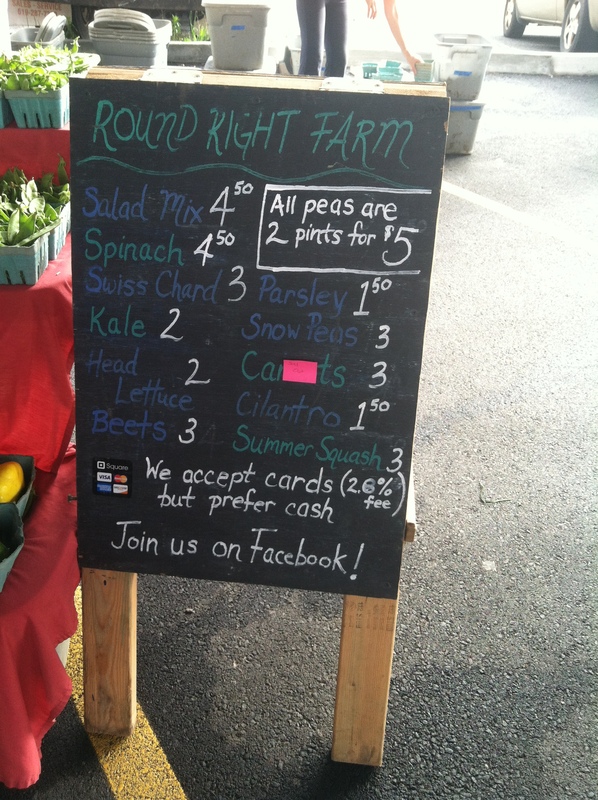 The farmers’ market vouchers were mentioned to clients at WIC when I observed this past week. So, now I that I could actually see how participants come and use the vouchers, it seems much clearer to me as to how the whole process works. Each WIC participant in each family gets a total of $20 worth of WIC vouchers to spend at vendors at the farmers’ market that accept WIC vouchers. So, for example if you’re a pregnant mother at WIC with 2 children under 5 years of age, then you would receive $60 worth of vouchers to spend. The vouchers have an expiration date of October 31st, 2013 so; this gives parents and families time to spend the vouchers as well. Each voucher packet has two $5 vouchers inside. So, each participant receives two packets. The vendors that accept the WIC vouchers have orange posted signs that families can look for when shopping at any of the farmers’ markets. 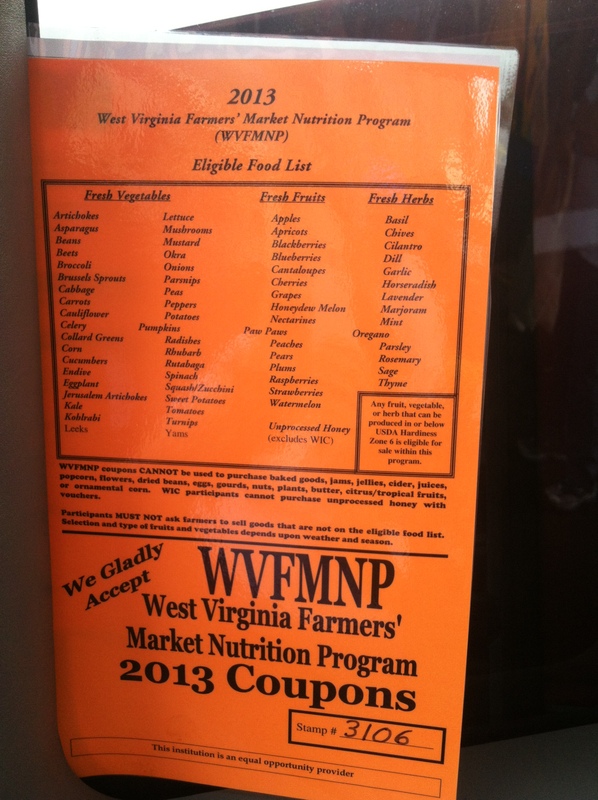 The WIC vouchers themselves are only distributed at the Morgantown Farmers’ Market on Spruce Street, the downtown location. WIC was given $2,500 worth of vouchers this year. The amount of vouchers that they are given each year depends on their redemption rate from the previous year. 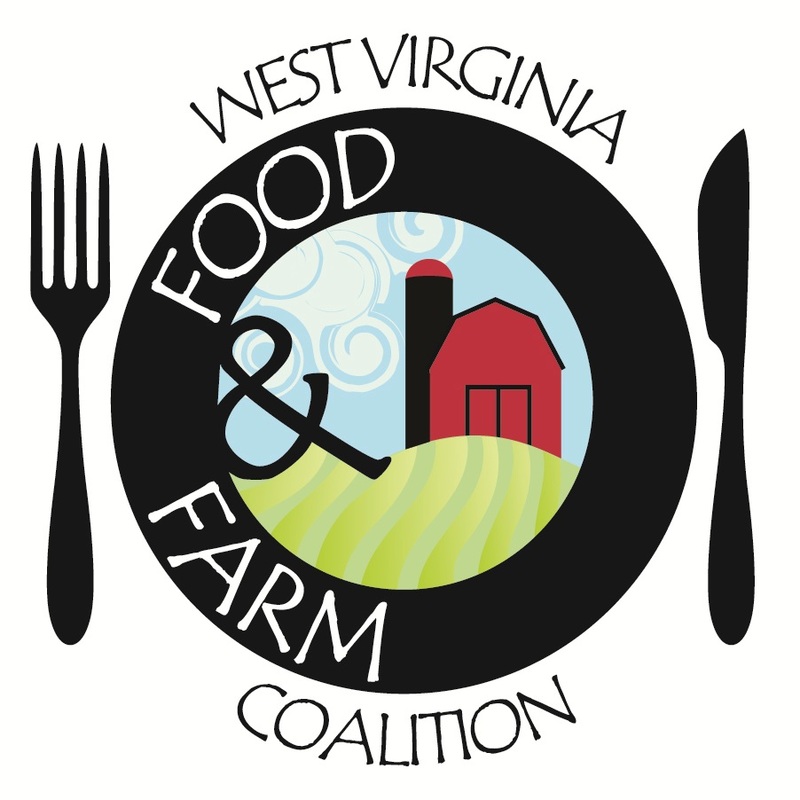 So, in 2011 the Monongalia County WIC farmers’ market redemption rate was 60%. In 2012, their redemption rate was 70% when the state redemption rate was 65%. So, from the numbers I observed it seems that if a county has a redemption rate higher than the state average, they receive more vouchers than the previous year and vice versa. When the WIC participants pick-up their vouchers at the downtown farmers’ market, they can use these vouchers at any of the farmers’ market locations in the area. Yes, the vouchers are only distributed at the Spruce Street location. 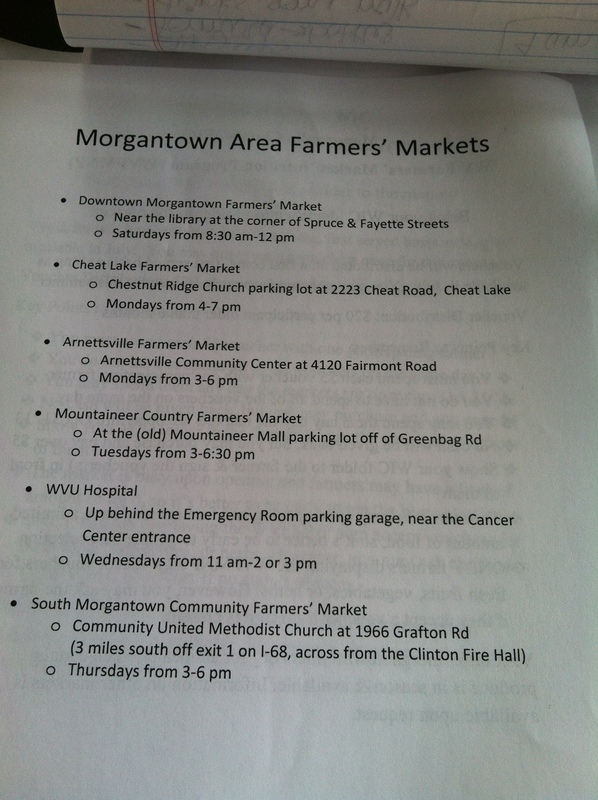 But, the vouchers can be spent at any farmers’ market listed below. The participants are only given the vouchers once per summer. The vouchers seem to be a hot commodity as well. 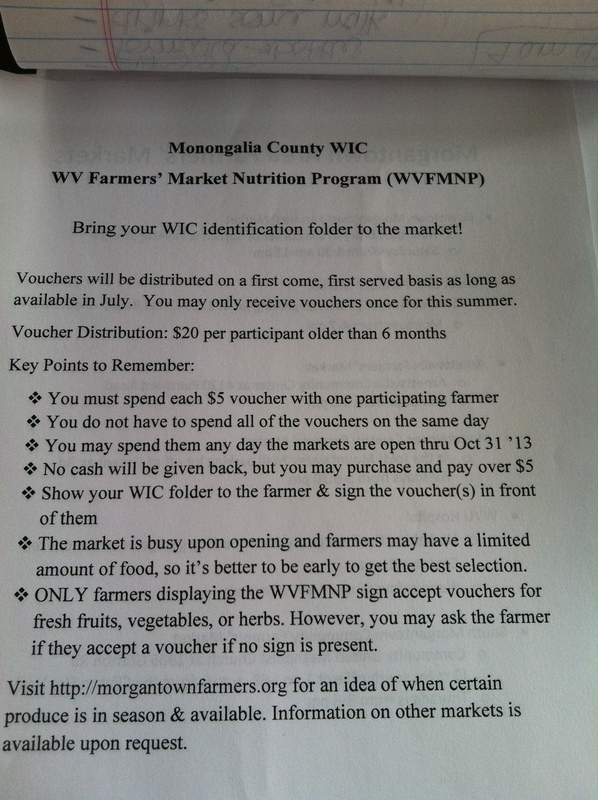 Last week was the first week that WIC was at the Morgantown Farmers’ Market to distribute the vouchers. Out of the $2,500 that WIC started with, they issued $1,900 last week. So, today we started with $600 worth of vouchers. They weren’t all given out today but, I can definitely see how WIC participants love using these. Not only does it serve as a convenience but, it also supports the local economy. The program, in a whole, is such a great motivator for WIC participants to increase fresh fruits and vegetables into their family’s diet. The only restriction on what the participants can purchase is that the vouchers will only be accepted for fruits, vegetables, and herbs. So, families can’t purchase things like eggs, proteins, or baked goods. But again, this is great because it encourages families to eat more fruits and vegetables and maybe even try a new fruit or vegetable! Did you know that May is Mediterranean Diet Month? The Mediterranean Diet is a way of eating reflective of traditions in the regions surrounding the Mediterranean Sea, in countries like Spain, France, Italy, Egypt, Morocco, Syria, Malta, Tunisia, Turkey, Algeria, Albania, Greece, Israel, Croatia, Libya, and Lebanon.. But, what most people don’t know is that you don’t need to travel around the world to get these heart healthy benefits. 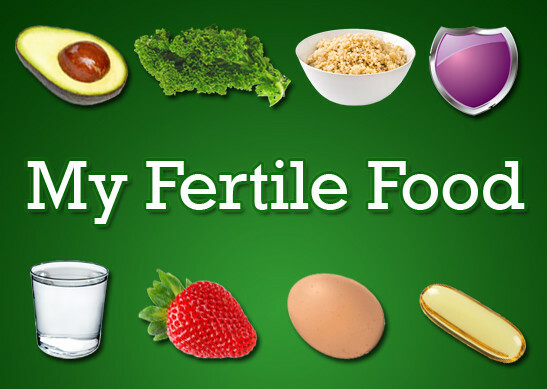 It’s remarkably easy to incorporate these types of foods into you and your family’s every day diet! 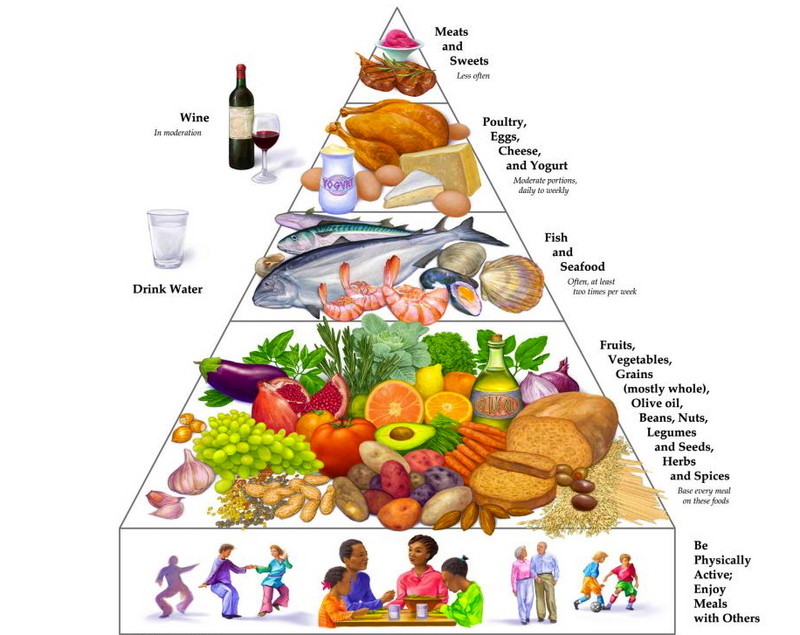 Did you know that the Med Diet has its own food guide pyramid? Here are some tips at following the guide from the bottom (proven to be the most important) all the way up to the top…. – Red meat and sweets, at the top of the pyramid, are “sometimes” foods to eat less often. Is the Farm Bill’s Nutrition Education Program under Attack? Since the Farm Bill is up for re-authorization, Congress is currently threatening to cut one of its components. This component is the Supplemental Nutrition Assistance Programs’ nutrition education (SNAP-Ed). SNAP-Ed empowers recipients to purchase healthy foods within a very tight food budget. The program employs hundreds of RDs in all 50 states. The Academy of Nutrition and Dietetics’ (AND) Farm Bill Work Group is making slight revisions to the 2012 Farm Bill Recommendation document to highlight the SNAP-Ed program among other aspects of the bill. o Maintain current funding for SNAP Nutrition Education (SNAP Ed), an effective program that empowers participants to change behaviors for healthy eating using knowledge tailored to their lifestyle. o Protect and strengthen the Supplemental Nutrition Assistance Program (SNAP), The Emergency Food Assistance Program (TEFAP) and the Commodity Supplemental Food Program (CSFP), key programs in our nation’s nutrition safety net. o Ensure funding for a variety of community-based and regional agriculture initiatives that expand the availability of regionally-grown food, create jobs, and promote economic development. o Support farm practices and policies that conserve soil, water, air, habitat and biodiversity, as these are essential to our survival, and help to assure that a next generation of farmers has access to land and the skills and incentives to grow healthy foods. o Maintain funding for the National Institute of Food and Agriculture (NIFA) and the Agricultural Research Service that includes Human Nutrition Research Centers for vital research to drive better nutrition, eliminate hunger, increase food security and healthy food systems and eliminate diet-related health disparities, including obesity and assure the availability of nutrition monitoring, food composition and related data. o Maintain funding for the Specialty Crop Block Grants in order to support food safety and nutrition research and a diversity of fruits, vegetables and nuts available to help people achieve the Dietary Guidelines for Americans. 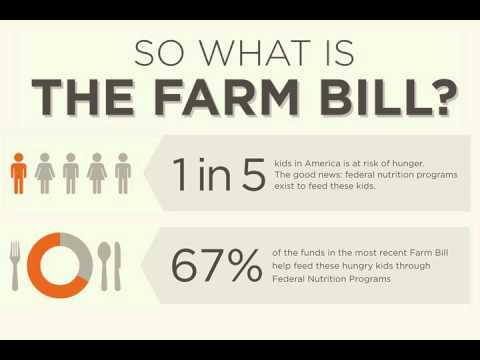 The Farm Bill is a critical piece of legislation that determines not only what farmers grow, but what is available in the United States food supply. Farm policies have existed in the U.S. since the establishment of our country. The 1920’s brought about the first big shift in agriculture policies, focusing on direct government intervention to provide income support by increasing crop prices and controlling supplies. Legislation continued to support farmers through direct income payments and crop supply management until 1996. At that time fixed income support payments were removed, making a shift to the modern commodity payments currently in place, and focused on issues surrounding food safety, food assistance and the environment. The most recent Farm Bill, 2008 Food Conservation and Energy Act, included several key provisions that impacted nutrition. – – Renamed the “food stamp program” to the Supplemental Nutrition Assistance Program (SNAP), to reflect a modern program, putting healthy foods within reach for people. – – Authorized a small pilot program, the Healthy Incentives Pilot, to research the effect of incentives in encouraging SNAP participants to purchase healthful foods such as fruits and vegetables. – – Created the National Institute for Food and Agriculture (NIFA) to coordinate agricultural research and Extension programs. – – Established funding for new programs to support producers transitioning to organic agriculture and to increase research in organic agriculture. So, now the real question is- what will happen next? Only time will tell…. A substantial amount of Americans suffer from “acid indigestion” or “heartburn.” Others may be diagnosed with GERD: Gastroesophageal Reflux Disease. 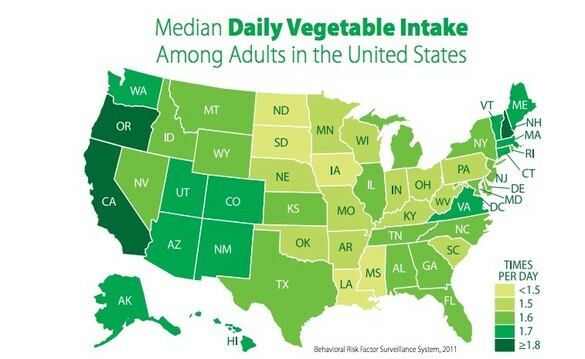 These conditions may be triggered by the “typical” American diet and lifestyle habits. The occurrence of these symptoms has increased with the growing epidemic of obesity. Well, let’s break the issues down… What are these conditions? How can we address their symptoms? 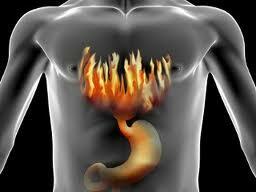 In heartburn and reflux, acid from the stomach flows upward into the lower end of the esophagus. This can be caused by pressure pushing upward, or relaxation of the otherwise tight muscle that normally keeps acid in the stomach. Pressure can be caused by overeating at a meal, pregnancy, some types of exercise, or being overweight. In the case of the muscle, it can be affected by actual changes in the muscle or substances that relax the muscle. The symptoms, in turn, can be a burning sensation and/or pain. Foods, beverages, and even certain medications can cause the muscle to relax. Stress, lack of sleep and smoking can also contribute to indigestion. Eating, especially large amounts before bedtime is another element. Despite the name, heartburn is not a condition of the heart, but the symptoms can mimic heart conditions. Regrettably, some people dismiss symptoms of heart complications, by blaming them on indigestion. Random indigestion or heartburn is not a problem. When it occurs on a regular basis, as in GERD, it can cause ulceration in the esophagus, bleeding ulcers, and an increased risk of esophageal cancer. 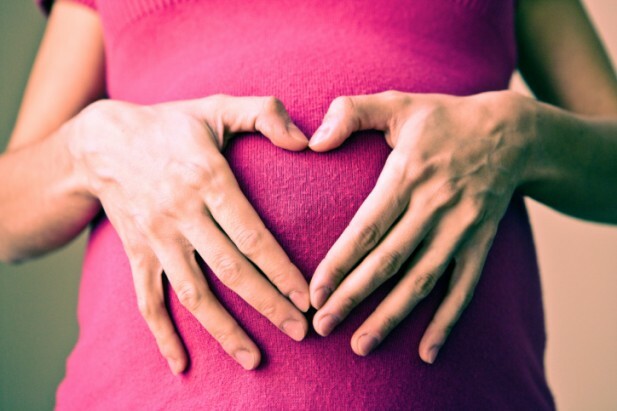 GERD is diagnosed when the reflux becomes more chronic and problematic. This occurs more than twice a week, becomes worse even with increasing doses of OTC antacids, causes problems with sleep, interferes with normal activities, causes hoarseness or worsening of asthma, invokes a chronic cough, causes chest pain, causes trouble swallowing, or causes a loss of appetite due to symptoms. As the article stated before, there are some foods that contribute to the cause of reflux, while other foods are more likely to irritate already inflamed tissues. Examples of trigger foods that can cause relaxation of the muscle would be fatty foods, alcohol, chocolate, coffee, tomato, onion, garlic, mint, caffeine and carbonated beverages. Foods that cause physical irritation might be abrasive grain foods (like some crackers or dry cereals), nuts, or some raw vegetables. Others might be acidic foods (citrus fruit/juices, tomato products) or spicy foods (pepper, chili powder, curry). Try using softer foods and beverages to provide nutrient needs when the esophagus is irritated. When it comes to fiber, try including more soluble fiber foods found in oats, cooked vegetables and skinned fruit. Cooking raw vegetables like steaming or roasting can reduce the abrasion. It can be helpful to keep a food and beverage record, as well as a symptom record to identify any triggers. Other habits that can be helpful might be eating smaller, frequent meals (rather than a few large meals), eating slowly, and chewing food thoroughly. You should also try stopping eating about two to three hours before bedtime and sleeping with your upper body elevated. Keep up with fluid intake, which is at least 64oz. spread throughout the entire day. 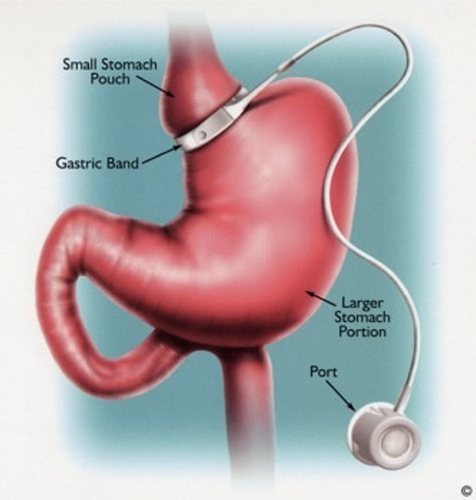 If being overweight is contributing to the reflux, weight loss would be an option. Healthy weight loss should be achieved by eating smaller portions of healthy foods spread over at a minimum of 3 meals. This pattern can help reduce total calorie intake while sustaining energy levels and putting you in better control over food choices. The smaller portions and more consistent food intake can directly improve the reflux as well. You should also make sure that your diet is nutritionally adequate, since some foods may be limited owing to reduced food intake and because you are avoiding reflux triggers. There has, and probably always will be, a debate as to whether consumers should purchase organic versus traditionally grown food sources. And I really didn’t think too much about the topic until I took an Agricultural Values and Ethics class my last year as an undergraduate, as a capstone requirement. Ever since then, I really have become aware of how information can really change how a consumer shops for groceries for their family. This being said… I came across a term, “The Dirty Dozen”, in several articles about organic food versus traditionally grown food. Every year, the Environmental Working Group releases a Shopper’s Guide. The guide has information on 45 different conventional fruits and vegetables and their pesticide loads. 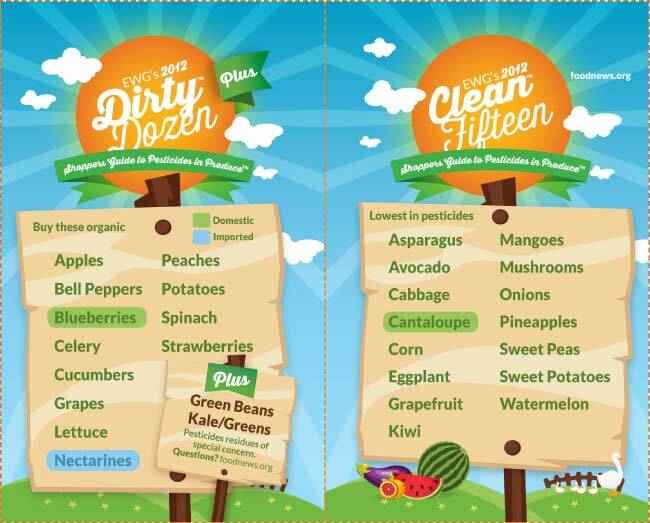 At the top of the list- the produce found to contain the highest amount of pesticides: is the Dirty Dozen. These are the 12 foods that they recommend consumers always purchase in their organic form. This Shopper’s Guide is based on the EWG’s analysis of pesticide residue testing data from the USDA and the FDA. Then, on the bottom of the list, are the Clean Fifteen. These are 15 foods that have the lowest pesticide residue. 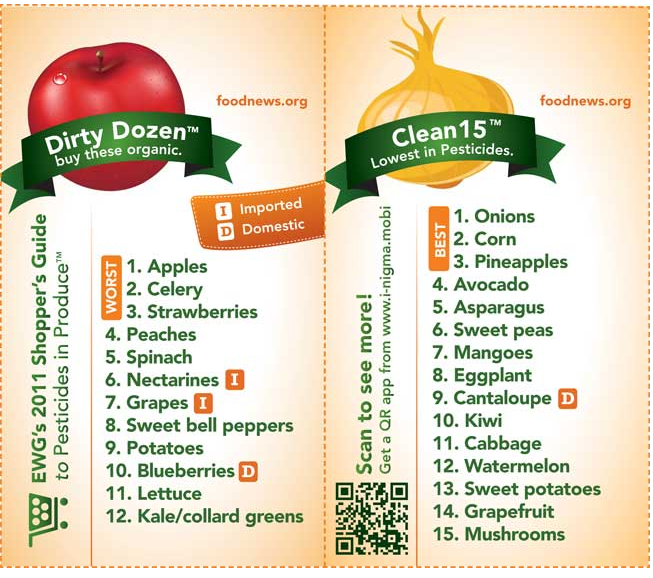 If you’re on a limited budget and have to pick and choose your organic produce, the EWG encourages that you spend the extra money for the Dirty Dozen in their organic form and buy the Clean Fifteen in their conventional form. Now that I’ve provided the education and substantial background on these organic-friendly foods, don’t get confused as to why I chose not to mention anything based on my opinion in this post. 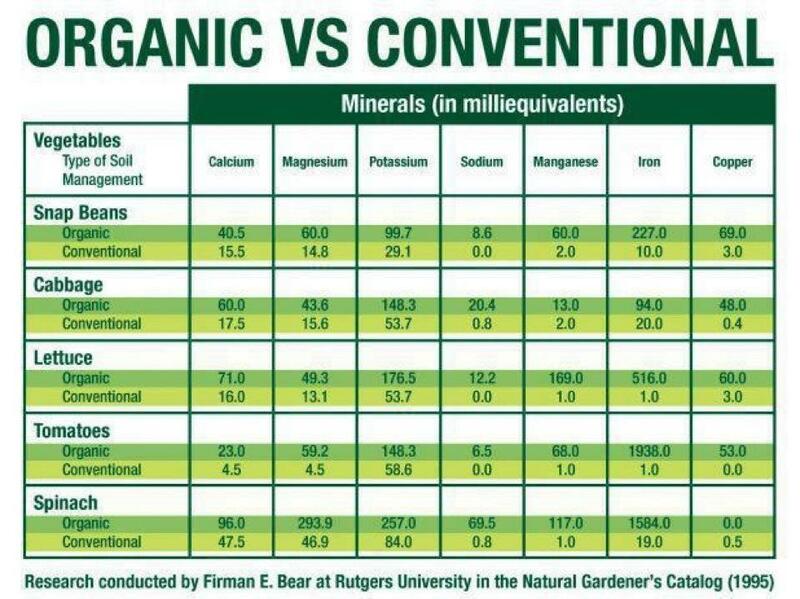 I personally, have different views about organic versus tradition foods. And again, I personally, will go out of my way to avoid purchasing organic foods. But, I’m not here to convince anyone to agree or disagree with my opinions. I’m here to provide nutritionally beneficial education to the public. And I hope I’m achieving this goal more and more as my ISPP Dietetic Internship, and future career as a Registered Dietitian, continue. Purple Corn is the New Rage? Recently Dr. Oz, yes THE Dr. Oz, has stated that the color purple is currently “hot”. And from my experience with anything that Dr. Oz says, nutritionally, everyone listens. 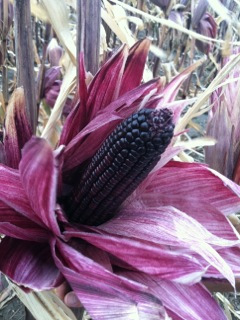 Purple corn has recently been crowned the king of the crop, according to Minnesota-based Suntava. From purple carrots, potatoes, tomatoes, cauliflower to blackberries, grapes, blueberries, and cabbage, a deep purple shade is usually a good sign that fruits or vegetables contain a healthy dose of valuable phytonutrients. Suntava purple corn has an ORAC value (per 100 grams) of 10,800, where blueberries have 4,669. ORAC scores should not be viewed in seclusion because they are a good indicator of the free-radical busting potential of foods. 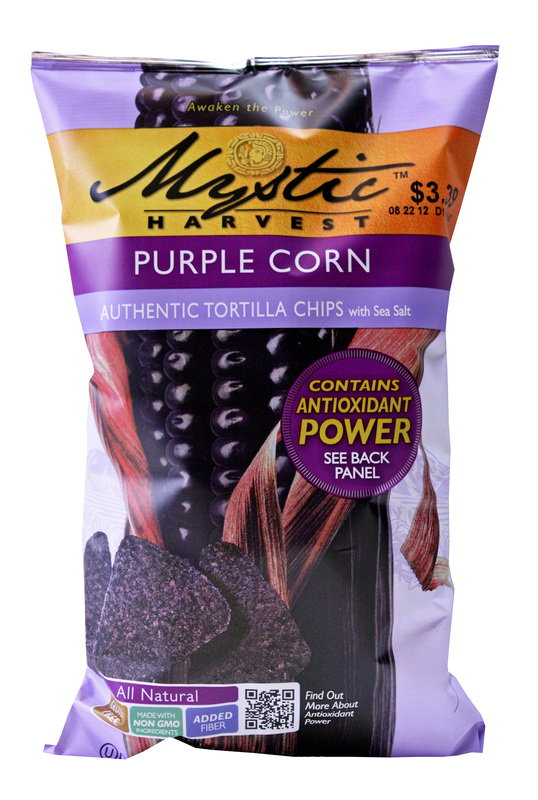 The average consumer probably has never heard of purple corn before, like myself. But, shoppers are increasingly becoming more aware of the powerhouse grain source. Suntava, which initially focused on bringing natural colors from purple corn to market as a replacement for synthetic dye Red 40, has since expanded into purple corn meal, which is used in everything from tortilla chips to snack bars, sourdough, cereals, and cakes. The important fact that really jumped out to me when I first read about the purple-colored food source, is that its non-GMO. While certain food companies are more interested in the novelty factor of purple snacks, others have really zoned in on the antioxidant message that this food brings to the table.